All the work along I-44 has us frantically searching for alternate routes in and out of the Patrick Henry neighborhood. Skelly Drive resembles the Baja 500 and the intersection of 51st and Harvard has been a war zone. But the work is necessary, and long overdue. The Skelly Bypass, as this stretch of I-44 through Tulsa used to be known, was originally built in 1957. The stretch between Yale and the Arkansas River has been virtually unchanged since then. And it shows. Bridges and underpasses are crumbling, the lanes are narrow and entrance ramps have merge areas that are "Oklahoma City-short." During this much-needed expansion of the Interstate we have seen many unique buildings razed or molested. Many of them were built when Skelly Drive was new and modern, so they typify that Mid-Century aesthetic. One business that has survived the highway construction is the Trade Winds East. It's hard to tell nowadays, but this Motor Hotel was quite a tiki showplace when it opened in 1959. 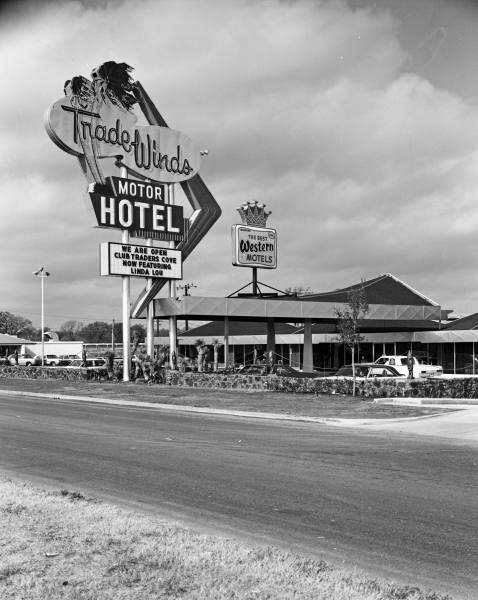 There were three Trade Winds hotels along I-44 in Tulsa- West was located at Peoria, Central is west of Harvard and East is just east of Harvard on Skelly Drive. The best known of the three was probably West, where the studios of KAKC radio were located along with the Tiki Nook lounge. Alas, the Tiki Nook closed in the Seventies and the western Trade Winds was demolished many years ago. Trade Winds Central is the largest of the three, and the least interesting to look at. I worked there one Summer as a maintenance man. I learned the secrets of vinyl mattress covers and adding chlorine to the swimming pool. We were told the owners of the chain were a family from Arkansas who bred race horses. In fact, the name Trade Winds happened to be one of their more successful thoroughbreds. It was during this short stint of employment I discovered two properties- the now demolished Patrick Henry Apartments and the Trade Winds East. Occasionally I was sent on errands to "East" to pick up a dead air conditioner or deliver pool supplies. This was when I discovered the poolside cabanas and zany roofline of the eastern-most Trade Winds. 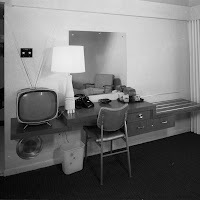 The complex was like a resort. Compared to its larger sibling across Harvard it was svelte, swingin' and ready to party. Back then I had no idea what Polynesian kitsch was, but I knew I liked it. The iconic sign with its palm trees and Googie shapes so fascinated me that a miniature version followed me home. I still have it more than 30 years later. Today the tropical stylings of the Trade Winds East are all but obscured with stucco-covered styrofoam. The entrance and main lobby area look perfectly mundane- unless you look closely. Large beams set at a 60 degree angle reveal that something special once happened where the wall meets the ceiling. Look under the latex paint and you'll find lava rock imported from a distant island. More lava rock was recently removed from out front for the highway expansion. Step out to the pool area and it's easier to see the hep and swinging style this place once oozed. Private cabanas are lined up along the west side of the swimming pool, each with a private patio. Their pyramid hip roofs match the larger points visible above the main building. The modest pool is outlined by a concrete apron that appears to indicate a dramatic downsizing many years ago. Today the pool is mostly quiet. The good news is the Motor Hotel has survived the highway project, is reasonably intact and still a viable business. Most of the "modernizations" are superficial and could probably be undone with a little effort. Hopefully it will survive long enough for some visionary soul to come strip off the fake stucco, expose its inner kitsch and turn it into a restored retro rest stop. And let's hope they re-create that sign!